Simple to use cash flow forecast template. Easily prepare cash flow and profit and loss forecasts with a projected balance sheet and forecast cash flow statement. Save time setting up lengthy and complicated spreadsheets with our simple cash flow forecast template. Avoid having to calculate complex Excel formulas. Avoid the worry of whether your numbers balance, as a projected balance sheet is built-in. Avoid the headaches and the lost time you can spend calculating which numbers to include on which reports. This has all been done for you. Escape the pain of working out where and how to include VAT (Sales Tax) in the correct places on your projections, as these calculations have all been carefully worked out for you. Save time reviewing your best and worst case scenarios with the built-in sensitivity analysis tool, which makes doing ‘what-if’ scenarios fast and easy. Are you struggling to know where to begin with your Excel spreadsheets? Do you have an impending deadline to have a set of professional cash flow and profit forecast reports ready by? If you don’t fully understand Excel, but still need to prepare a cash flow forecast, then our cash flow forecast template is the ideal solution for you; why? Because it’s a simple and easy use data entry styled template. “It took only 10 minutes and I had a complete cash and profit forecast printed and ready for the bank, including balance sheets.” Adrian B in the UK. Are you the kind of person who looks at an empty Excel spreadsheet with trepidation? Do you open Excel and stare blankly at the squares on the page, not knowing where to begin? If this sounds familiar, then our Excel template software is the solution to all your Excel nightmares. You get to save valuable time on formatting professional reports. The report formatting is already done and are ready to fit the page. Do you get lost using Excel’s ‘@if’ or ‘fx’ functions? Do you even know what these are? Does the thought of trying to work out a bunch of Excel formulas, required to prepare a set of cash flow forecasts for your small business, fill you with dread? Would you prefer to simply enter your forecast numbers directly into an easy to use cash flow forecast template? Does the thought of having it all worked-out for you sound appealing? Does the thought of not having to worry about which numbers appear on the cash flow forecast vs the profit and loss forecast, not to mention not worrying whether everything adds up and balances, sound like the ideal solution to you? Well there’s no need to worry, as we’ve spent the time and done the hard work for you. We’ve created easy to use data entry templates that make the whole task of preparing projections very simple and straight forward. Do you understand how to use Excel, but lack the time to prepare a cash flow forecast? Are you short of time? Are you already working 80 hours weeks running your small business? Is the thought of spending hours putting together complicated spreadsheets the last thing you want to be doing? “The cash forecaster software has saved me valuable time and has been incredibly useful in preparing detailed reports for both the bank and management information.” Grace in the UK. Do you want to avoid wasting valuable time trying to get your projected balance sheet to balance? You may or may not already know how to prepare a balance sheet, but whether you do or not, it still takes time and it takes plenty of thought to calculate where to put numbers onto a projected balance sheet. With Cash Forecaster you avoid the worry of whether your numbers balance, as there’s a projected balance sheet already been built-in to the cash flow forecast template; which updates automatically. 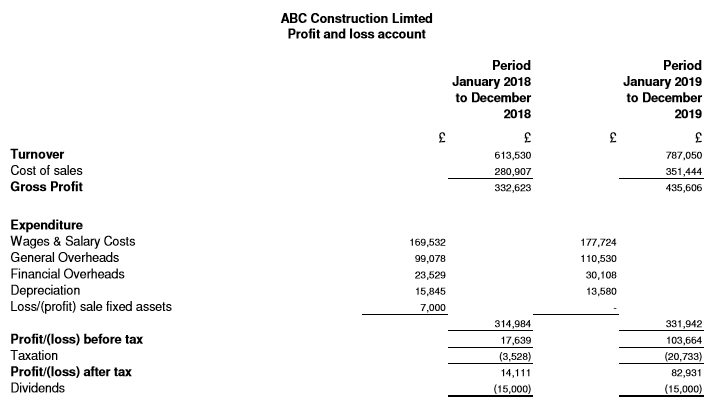 The main reports include a profit and loss forecast, forecast cash flow statement, cash flow projections and a projected balance sheet for 12 months to 7 years. The forecast assumptions report details the main assumptions used in the forecast period. Details include the rate of interest that would apply to an overdraft that may be required in the forecast period. Versus interest income on money in the bank that would apply to surplus cash in your forecast period. The forecast assumptions report also details information about the depreciation rates of fixed assets and also shows information on company taxation rates. The tax detail shows the adjusted profit for tax, along with the tax rate for that forecast period and the estimated tax too. Hover your mouse over the image to enlarge. The forecast summary report is a quick glance report of the profit and loss and cash flow forecast. with a break-even analysis. The cash flow summary includes a 12-monthly detail of opening and closing bank balances, together with the net income and payments. The summary profit and loss includes the turnover, cost of sales and gross profit detail, together with a summary of the expenditure and taxation charge. At the bottom of the forecast profit and loss is the break even analysis. The cash flow forecast report provides the breakdown of ‘cash-in’ and ‘cash-out’ for each 12 month; 24 month; 3 years, 4 years, 5 years; 6 years and 7 year period. ‘Cash-ins’ include payments received from customers, loan advances, proceeds on sale of assets and any other income. The ‘cash-outs’ include payments to suppliers, capital expenditure, loan repayments, tax payments, dividends and any other cash out-flows. The forecast profit and loss report provides a breakdown between the sale, cost of sales and gross profit and the expenditure detail. These forecasts are for 12 month; 24 month; 3 year; 4 year; 5 year; 6 year; and 7 year profit and loss projections. The expenditure detail is summarised between wages and salary costs, general overheads, financial overheads and depreciation. In addition to having a conventional cash flow forecast, Cash Forecaster also includes a forecast Cash Flow Statement. 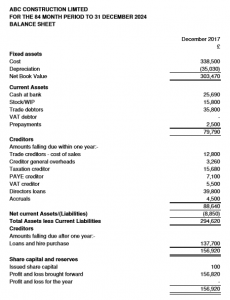 The Cash Flow Statement provides a forecast for 12 months to 7 year and is broken down between operating, investing and financing activities and follows FRS 102 guidance for its layout. The Cash Flow Statement shows inflow and outflow of cash and cash equivalents from various activities of a company during the forecast period under the main heads i.e., operating activities, investing activities and financing activities. Information provided through the Cash Flow statement is useful to assess the ability of any business to generate cash and cash equivalents, whilst providing information on the needs of the enterprise to utilise those cash flows. The forecast trading summary report provides a breakdown sales and cost of sales, which provides the detail to support the profit and loss forecast. The forecast trading summary is split between the breakdown of turnover and shows the various sales lines and the breakdown of cost of sales. The sales are adjusted where appropriate for any advanced sales or provisions for prepaid sales too. Whereas cost of sales is adjust for any movements in stock and/or work in progress and accruals. The overhead report provides the detail to the forecast overheads of the business and supports the forecast profit and loss report. The overhead report provides the breakdown of the main expenditure headings for the projected profit and loss, which are the ‘Wages and salary costs,’ ‘General overheads’ and ‘Financial overheads. The reported numbers on the forecast overheads report are net of any accruals and/or prepayments provided for in the forecast period. The projected balance sheet report is a forecast balance sheet at the end of each year of the forecast periods. Which can be anything from 12 months to a longer term cash flow forecast of up to 7 years. The balance sheet provides the usual analysis between fixed assets, current assets, current liabilities, long term liabilities and share capital and reserves. The figures included on the balance sheet are calculated automatically by the cash flow forecast software. A projected balance sheet makes up one of the most important components of a set of projections and business plans. In addition to the end of year balance sheet, Cash Forecaster also has a monthly balance sheet too. The monthly balance sheet provides the same information as the period end balance sheet, except that the information is reported at the end of each and every month of the cash flow forecast period. The forecast fixed asset report provides the detail of the additions, disposals and depreciation of fixed assets in the forecast period and support the balance sheet. The report is split out between the cost of the fixed assets and the depreciation. The cost of fixed assets shows the movements relating to additions and disposals during the forecast period on a month by month basis. The depreciation section of the report shows the month by month depreciation charge for each of the asset headings. Finally, the report also provides a breakdown of asset disposals and shows the profit or loss on disposal. 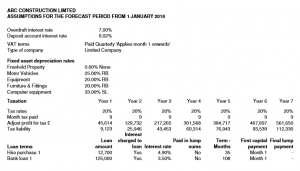 The forecast loan report provides a detailed breakdown of the loans and hire purchase amounts in the forecast period. The loan report is split between each of the ten possible loans you can have in the forecast period. At the top of each loan is a summary of the main elements of each loan. This consists of the loan interest rate, the loan or hire purchase term, first month of the loan repayment, the capital sum borrowed and total interest and payments. The report also includes an analysis of the repayments and interest charges throughout the period of the loan. The forecast loan and hire purchase report provides the breakdown for the balance sheet. The VAT (Sales Tax/GST) report provides a breakdown of the VAT (Sales Tax) entries in the cash and profit forecasts. The VAT (Sales Tax) report is split between the amount of VAT (Sales Tax) is charged on sales and the VAT (Sales Tax) paid on cost of sales and expenses. The report shows how the net payments or refunds are made up that appear on the cash flow forecast. The closing balance that appears on the balance sheet is also shown on the forecast VAT report. The Payroll Taxes report (which in the UK is PAYE) provides a breakdown of the payroll tax entries in the forecast period. The report summarises the deductions from the payroll entries in the forecast period either from cost of sales wages costs or from the overhead wages expense deductions. The report also displays the amounts and when these are paid to the Government and supports the cash flow forecast report. The closing balance that appears on the balance sheet is also shown too. The forecast factoring or invoice discounting report provides a detailed analysis and breakdown of factoring entries in the forecast period. The report analyses the factored sales and shows the movements in factor advances and repayments during the forecast period. The numbers shown support the cash flow report payments and receipts, as well as the projected balance sheet report to backup the closing balance on factoring or invoice discounting. The backup report provides a detailed breakdown to support the forecast profit and loss, cash flow and balance sheet reports. On the backup report there’s a more detailed breakdown of customer payments between the various credit terms. There’s also a more detailed analysis of the factoring movements on the cash flow forecasts. Also, there’s an analysis of the supplier payments which are separated out between the various credit terms. The forecast monthly reports are designed to pull-out whatever period you like. This includes comparatives of your choice for the profit and loss and projected balance sheet. In the example forecast monthly report the two periods chosen are the 12 months from 1 January 2018 to 31 December 2018 and the comparative is for the 12 month period from 1 January 2019 to 31 December 2019. These periods can be changed to suit whatever period you would like to pull out from the forecast numbers. The forecast month report consists of a forecast profit and loss report, an overhead breakdown report, a projected balance sheet and a profit and loss reconciliation report. We have customers around the globe, so it’s important to include the facility to change the currency displayed on the reports. This is easily done from the information tab on the cash flow forecast template. Many times cash flow forecasts are prepared for the purpose of obtaining either bank finance or for receiving investment from an investor. Fix your own loan repayment amount or use the automatic loan repayment calculator. Having the ability to split-out projected sales between various products or service types is important. Where applicable, to account for the different factoring (or invoice financing) rates applicable to different income types. Our cash flow forecasting template incorporates all of these features across twenty different sales lines. As with forecasting sales data, projected cost of sales sometimes needs to be split between different types of purchase from different suppliers. Our cash flow forecasting template includes up to twenty lines for your cost of sales. You can break this down between your different suppliers or types of cost of sale. Set your cost of sales to include payroll costs, where applicable, which require payroll tax entries. 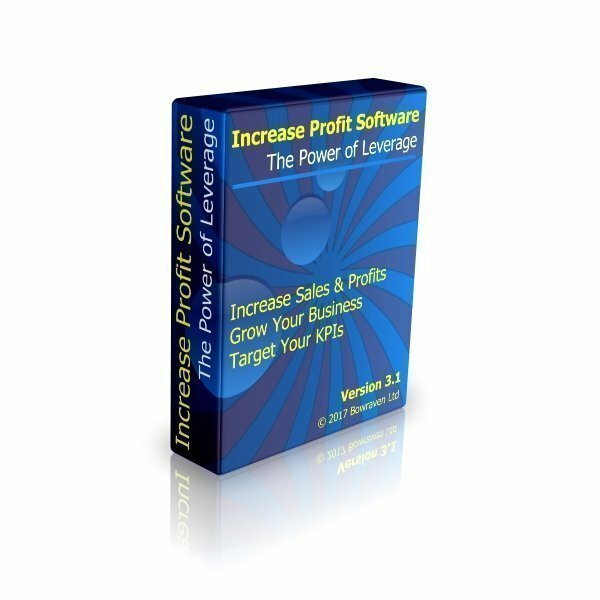 Cash Forecaster incorporates all these features across 20 cost of sales lines. Many times a cash flow forecast is prepared to calculate the amount of overdraft facility is required for working capital for a business. Where an overdraft is required and where the cash flow projections dip into an overdraft position, it’s important to be able to calculate the amount of interest this will cost for the amount of overdraft forecast to be used. This is another useful feature that’s built into our cash flow forecast template. All that’s required for you to do is to enter the overdraft interest rate, and the template calculates the interest for you, which is based upon the level of overdraft forecast. We have built-in a wide range of customer payment terms. This ranges from allowing up to 12 months credit terms and all the way through to up to 24 months advanced payment terms. With the credit terms, you have the option to set each of the separate sales lines to a different payment term of up to 12 months forward. Of course for any small business, we work towards keeping our customer payment terms to as short a period as possible, however, some businesses allow for longer times to pay. This is especially true for businesses that have to allow for customer-retention’s, which can be anything up to the full 12 months. In addition to having the feature to allow credit terms for customer payments, you can also set these terms to ‘cash’ terms where customers pay right away. This includes payments by credit or debit card, and where a sales line is allocated to credit card payments, the cash forecast template will automatically calculate the credit card charge too. Finally, the cash flow forecast template includes prepaid sales income too. You can set the payment term from anything from one month advanced payment through to 24 months in advance. The in-built supplier payment terms function removes the difficult calculations of when and what to include on either the cash flow forecast report or on the profit and loss report. 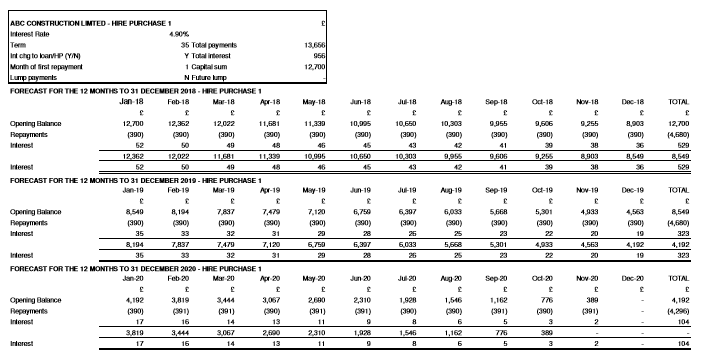 Plus what is also shown on the projected balance sheet at the end of each month of the cash flow forecast period. Most businesses arrange credit with their suppliers. Supplier credit terms mostly fall in the range of between 30 days to 120 days. However, occasionally, we need to be able to enter extended credit terms for suppliers. The payment terms include in our cash flow forecast template range from ‘cash’ or immediate payment terms, through to 12 month supplier payment terms. As already mentioned it’s possible to set any sales income you forecast to receive that is paid by either debit or credit card. Where this is the case, credit and debit card payments are subject to a service charge. This is easy to take account of by simply entering the credit card rate and setting which sales income credit card charges apply, and the cash flow forecast template calculates the rest for you, and it includes the correct amounts on the various cash flow forecast and profit and loss forecast reports. Where a business has to account for VAT (Sales Tax) or GST in Australia and New Zealand, it’s important to make these entries as easy to deal with as possible. Our cash flow forecast template achieves this by allowing the you to easily select a VAT (Sales Tax) rate for each sales line, cost of sales line and overhead line, and the template does all the hard calculation for you. These sometimes complex calculations are all done simultaneously, as you enter your data. The template calculates on which report to include the either net or gross of VAT (Sales Tax) amounts, and where to enter the VAT (Sales Tax) itself. Plus including the balance owed at the end of each period on the relevant projected balance sheet too. The payroll tax feature makes it quick and easy to split your employee costs between what’s paid to the employee and what’s paid to the government in taxes. Where your small business employs people, there are the dreaded payment taxes to take account of. This means that a percentage of the wages cost is paid directly to the employee and the balance is paid to the government in the form of taxes. In the UK this is referred to as Pay As You Earn or PAYE. As the time of these payments affects forecast cash flows, it’s important to split out the different timings of the net pay vs the payroll tax element of wages costs. Our cash flow forecast template does these calculations for you. All you have to do is to enter the gross wage cost and select a payroll tax rate, and the forecast template calculates the rest for you. These calculations include the timings of where and when to include the employees net pay versus the government payroll tax element on the cash flow forecast report. Plus of course the inclusion of any closing balance at the end of each forecast period on the projected balance sheet. Save time with the built-in company tax feature, which provides a simple and fast way to include tax payments into your cash flow forecasts. This you saves time and a few headaches. All you have to do is select the month the tax is paid in and the template does the rest. An on/off switch to include the feature or not if you choose to have the feature or not. The ability to adjust when the taxis paid, which can be adjusted for each forecast period separately. The feature to either spread the tax between each of the months on the profit and loss forecast, or to include it in a single month. Tax adjustments so you can change the actual profit to taxable profit by entering either add-backs or deductions from actual profits. Tax rate adjustments, which can be changed for each of the separate forecast periods. Carry back of carry forward of any losses in the forecast period to be set against profits to reduce tax liabilities. Most small businesses either already have fixed assets or intend to purchase fixed assets during the forecast period. Fixed assets like freehold or leasehold properties, motor vehicles, equipment, computers and fixtures and fittings. The type of fixed asset with a choice of up to eight different types. VAT (Sales Tax) rate for the fixed asset where applicable. Month of the purchase, where it’s a new asset bought. Month of sale, where the asset is disposed of. Any depreciation up to the date of sale. Within the eight fixed asset types there are also two ‘cost of sale’ fixed assets. This means that where these asset types are selected, the depreciation is automatically included within cost of sales on the forecast profit and loss. Additionally, the profit or loss on any fixed asset disposals in the forecast period can be selected to be included above the line, or in cost of sales too. Most fixed assets are depreciated. Where they are depreciated, this depreciation is charged to the profit and loss. Our cash flow forecast template includes this calculation, which is done automatically for you. It’s extremely easy to set the different depreciation rates applicable to the individual fixed asset types. Once set, the appropriate depreciation amount is included on the profit and loss report and the accumulated depreciation is included on the project balance sheet too. Where assets are sold during the forecast period, the amount of depreciation that has accumulated to that date is taken into account on the projected profit and loss report within the profit or loss on sale of that fixed asset. Businesses that account for either stock and/or work in progress need to include these entries on cash and profit forecasts. Our cash flow forecast template includes up to six stock lines. These stock lines can be adjusted either up or down at the end of each month of the forecast period. These stock adjustments makes sure the cost of sales figures are accurate. Having the ability to include stock, means that the timings and amount of forecast product purchases can be correctly reflected in the cash flow forecast. Thereby making sure that the correct projected working capital requirements are calculated too. When preparing cash flow forecasts and profit and loss forecasts, it’s important to run what-if best case and worst case scenarios. However, the last thing you want to be doing is to be entering the data over and again for each different scenario. This is why we’ve incorporated a ‘what-if’ scenario function. With this feature it’s extremely easy to adjust either up or down by any percentage the sales or cost of sales of the projections. With the click of a button and an entry of a percentage, you’ll be able to adjust sales and cost of sale independently. So you could separately reduce sales by say 10% and increase cost of sales by say 5%. Or any other combination of your choice. This allows you the ability to prepare multiple reports very quickly,with your best-case and worst-case scenarios, which is something that most banks and investors like to see. Some don’t like to show a worst case scenario for fear of not obtaining the loan or investment, however, by pre-preparing these best and worst case scenarios, not only is that good practice for you as a company to review, but it also comes across extremely well to a bank and an investor. It allows the bank or the investor to make a better informed decision about either the lending or investment proposition. Also, being planned in this way is being fore-armed too. By running the various what-if scenarios, you’ll be able to incorporate these into your business plan too and explain the likelihood of any of these scenarios happening. You’ll be ready for the questions and have already prepared answers to the likelihood of any of these scenarios happening in the forecast period. I’m not sure I’ve come across a small business that doesn’t have a directors loan account. So of course this feature is included in Cash Forecaster too. There’s an easy data template to enter the month and the amount of the directors loan or the repayment of their loan for up to six directors/shareholders. There are sometimes cases where a business has other debtors or other creditors, as well as other sundry income. These are also dealt within the cash flow forecast template with a straight forward data entry template. With the other income, you can set the payment terms on this for any period of up to 12 months credit in a similar way to sales income. The other income also has the feature of setting the VAT (Sales Tax) percentage for the type of income. There are three other income types to work with too. The ability to enter your opening numbers forms part of the cash flow forecast process. Opening balances on your bank, customer balances or supplier amounts owed can all be entered in an easy opening balance template. Where a business is not a startup business, this function may not necessarily be needed, unless the business has already begun trading at the point of preparing the cash flow forecasts. In which case, even for a startup cash flow forecast, the opening balance function can be used. Businesses not already using invoice financing can set the month in which they intend to start using factoring. This feature will allow you to see the affect switching to invoice financing has on your cash flow forecasts. Businesses already using factoring can use the invoice financing feature to prepare accurate forecasts that reflect the way they receive customer payments via a factoring company. Businesses that are already using factoring, as a way to provide faster cash flow to their small business, can use our cash flow forecast template to see the affect on future cash flows and working capital where the invoicing finance facility is cancelled. Another possibility is that, as the cash flow forecast template will forecast cash flows for up to 7 years, you also have the ability to see the affect of introducing factoring and then cancelling the facility a few years down the track. The ability to switch headings between factoring or invoice discounting. Whether the customer balances at the start of the month in which factoring commences to be factored, or advanced. Set the percentage of the opening balance that is ‘factorable.’ Plus set how much the factor company will advance. Both these percentages can be set anywhere between zero and 100%. The percentage of each sales line that is factorable and how much will be advanced too. The month in which factoring ends. The ability to use accruals and prepayments in a cash flow and profit forecast is key to accuracy in reflecting the correct profit or loss, whilst at the same time forecasting the correct cash flows too. There are up to eight prepayment lines, which can be allocated to separate overhead expense lines. These are easy to enter and adjust at the click of a few buttons.to easily adjust your forecasts to tie in with payment timings and what’s charged to the profit and loss. Included in the cash flow forecast template are up to ten accruals lines. The reason for more accruals than prepayments is that you have the ability to accrue for both overheads and cost of sales. Accruing for cost of sales is an essential feature for construction companies that are preparing cash flow forecasts. The ability for a construction company to reflect the true construction costs in the correct forecast period is an essential part of a construction company’s business planning. It’s easy to set the expense or cost of sales line the accrual affects and to enter the amount of the accrual in the relevant month of adjustment. The accruals and prepayment feature allows you to enter accurate amounts relevant to particular expenses and when they appear in the business’s cash flows, and then use this facility to adjust what and in which month the expense falls on the projected profit and loss report. All the headings come with default text, but each of the headings text can be changed to suit your business. It’s quick and simple to choose the length of the forecast period you require. Followed by entering your data, to have professional reports suitable for banks, directors, company shareholders and investors, all done within a very short space of time of downloading this cash flow forecasting program. It would seem that the more popular forecast periods for a small business cash flow forecast are somewhere between a 12 month cash flow forecast, a 3 year cash flow forecast and a 5 year cash flow forecast. Our cash flow forecast template has been setup so that you can quickly and easily switch between the length of reports you want to include. The periods available for all the reports is anything between 12 moths and 85 months or 7 year forecasts. “We can recommend the cash flow forecaster as being a very simple programme to use, producing professional-looking reports, very reasonably priced and saved us many hours of work compiling our own initial spreadsheet. The after-sales service was also extremely efficient.” Jane Heard Associates. Our 30-Day Promise To You: If for whatever reason you buy our cash flow forecast template software and you don’t like it, we will refund all your money; no questions asked. The original Cash Forecaster was built when Russell had his own Chartered Accountancy Practice. Cash Forecaster is so different then, to what it is today. These improvements and changes are thanks’ to customer feedback. It’s thanks’ to to their requests for features to improve the template for what they needed it to do, but in the end everyone benefits from the upgrades. One client was recommended to use our our cash flow forecast template by Lloyds Bank Plc. This customer asked for a specific report, so we upgraded Cash Forecaster free of charge, as it would also benefit future customers too. Our focus is on a commitments to customers. So if you’d like us to add a new feature that will help you prepare cash flow forecasts for your small business, we will include it free of charge. The only caveats are: the feature required is possible to do; and we feel that it will benefit other clients too. And remember, this unique service is provided completely free of charge. Also, if your initial purchase was dependent on the new requested feature being included, and we are not able to deliver on this promise, we will extend the 30 day money back guarantee to the point at which we are not able to deliver on your request. In which case you’ll get 100% of your money back…no questions asked. Longer customer payment terms to allow for builder retention’s of up to 12 months. The ability to specify whether depreciation for asset categories is treated as cost of sale or not. Increase number of stock lines. More lines for accruals and prepayments. 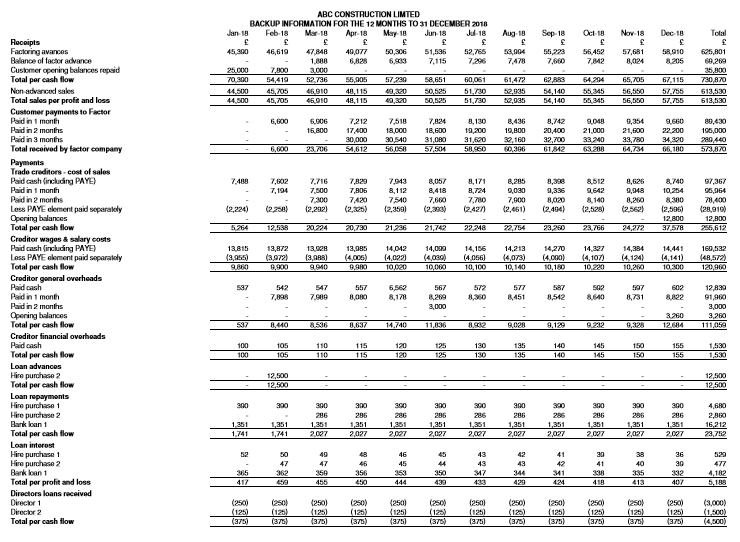 Forecast cash flow statement report in addition to the usual cash flow forecast. The ability to incorporate prepaid sales to accommodate small businesses that receive money in advance from customers. The software is Excel Template based. You will need to have Microsoft Excel installed on your computer in order run the software. However, you don’t need to have an expert knowledge of Excel or of spreadsheets to use the cash flow forecast template. It’s easy to use and fully explained in the user manual that accompanies the software when you download it to your computer.